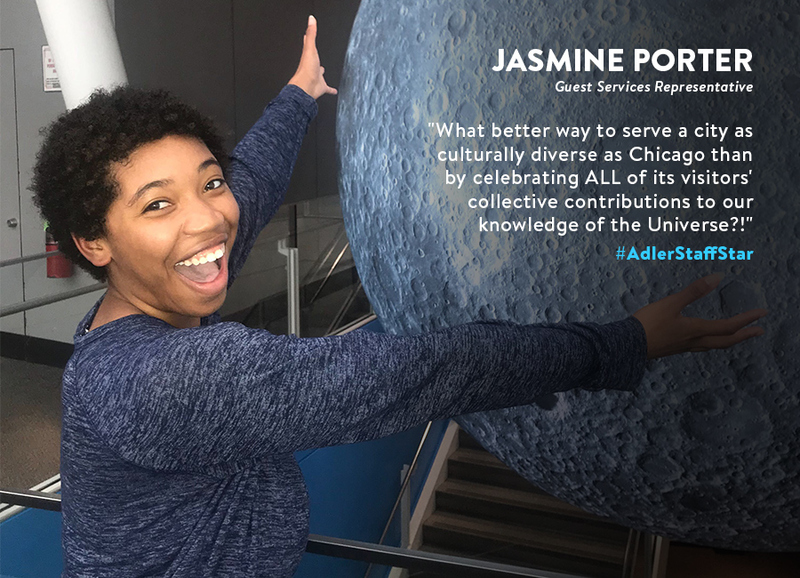 Adler Staff Star: Meet Jasmine! What do you enjoy the most about working at the Adler? My coworkers, for sure. They’re all so witty and fun to be around, and bursting with talent! I don’t think I’ve ever worked with a more interesting group of people before. On top of that, they’re all very compassionate, I feel lucky to know them. We hear that you helped our Experience Development team plan some activities to celebrate Black History Month at the Adler. That’s so cool! Can you tell us about this experience and your role? This past June my boss, Joseph, made me aware that Adler wanted to host a larger, more formal celebration of Black History Month for 2019. From previous conversations among the Guest Services team, he knew that this was a project that I’d want to participate in. The Experience Development team invited me to join the brainstorming process, which has now blossomed into a very unique set of events that I hope our guests and staff will cherish forever. What excites me most about this project is the seeds that it has planted. We now know what’s possible in terms of cultural awareness and acknowledgment, and I feel that this has opened many doors for diversity and inclusion at Adler. There is literally not a single member of humankind, in any time or place, who has not looked up at the sky and pondered about our Universe. What better way to serve a city as culturally diverse as Chicago than by celebrating ALL of its visitors’ collective contributions to our knowledge of the Universe? Do you have any STEM heroes or role models that you look up to or get excited about? Way too many to list here, so I’ll just tell you the two who come to mind immediately. Mae Jemison of course! I always admired the myriad of skill sets that she has. She was a general practitioner, astronaut, biologist, physicist, at one point a dancer, it’s like what can this woman not do! I also love that she’s an initiator, she’s aware of humanity’s potentials in terms of how we can use science and any form of creativity to improve our lifestyles, and she just continues to work until those grand visions of hers come to fruition, which is beautiful. Lisa Randall is another on of my heroes. I first saw her in an issue of Vogue magazine and I remember being so inspired by that article because I had never actually seen a female theoretical physicist before. Yet there she was talking about multi-dimensional universes! I used to keep the magazine on that page, and re-read the article over and over again. I’d stare at the equations on the blackboard behind her and say “I’m gonna know how to solve those when I grow up.” For now solving theoretical physics equations its still on the bucket list, but she’s still my hero! If you had the opportunity to take a 10-year-trip to Mars, would you do it? Why or why not? Of course I would! Going to Mars is still a dream of mine. I actually hope to retire there when I become a senior citizen. I feel that being a multi-planet species is a very healthy alternative for not only us, but for Earth. It frees up space on this planet, which means less waste, extracting less from the Earth in order to accommodate the masses, more flexible resource distribution, and also less pressure on existing infrastructures. If anything, I believe the first Martians will show us what’s possible in terms of working with a planet as opposed to taking from it, since they won’t have much of a choice. I see a huge potential for space habitation to provoke a shift in our collective towards more inclusive and considerate forms of innovation. Plus its just cool! Why not cease an opportunity to leave your home planet? Why, in your opinion, is space freaking awesome? Space is freaking awesome because it’s the ultimate unifyer, everything exists within it and is essentially made of it. All that exists, be it a planet, star, or person, is simply a different expression of the same Universe.